The world might be your oyster, but Jamaica Bay is full of the bivalve molluscs. Starting with 36 thousand oysters last week and 12 thousand more this week, the largest single installation of breeding oysters in New York City began. A spokesman from the mayor’s office said hundreds of thousands of juvenile oysters will be added in the spring. 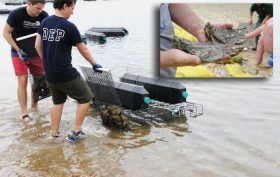 Oysters filter pollutants from water, help to protect wetlands and shoreline from erosion and storm surge and provide habitat for communities of fish and other aquatic organisms. The mass of oysters in the New York/New Jersey Harbor dwindled due to over harvesting, dredging and pollution.